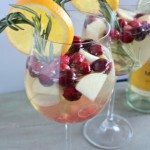 Christmas Sangria combines seasonal fruit like cranberries, pomegranates, apple and orange slices with white wine, white grape juice, and sparkling seltzer to create a beautiful, sweet, and crisp holiday drink. Follow my tips below on how to make my favorite winter sangria recipe. 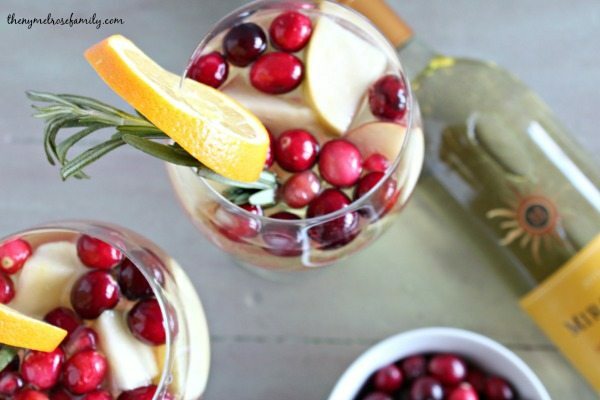 I couldn’t wait any longer to share this amazing recipe for Christmas Sangria. Over Halloween, we spent the weekend with my husband’s family, which you might remember from our family Halloween Picture. So fun! While we were there my sister-in-law introduced me to the world of white wine Christmas Sangria. For some reason I had always thought that Christmas Sangria could only be made with red wine. Boy was I mistaken! Our Christmas Sangria combines fresh fruit of the season with Mirassou Sauvignon Blanc, which is my absolute favorite wine ever! I love the fresh fruit in this winter Sangria. It not only looks so pretty, but it tastes so good at the end. My first glass usually goes down rather quick just so I can get to the fresh fruit in the bottom of my glass. This Christmas Sangria has cranberries, pomegranates, sprigs of rosemary, apple and orange slices, which combine to create the gorgeous colors of Christmas. Avery and Riley were underfoot when I was making this Christmas Sangria and watched in awe as I opened the pomegranate. The trick to getting to the pomegranate seeds out is to slice all the way around the middle of the pomegranate without slicing through. You’ll then want to turn and pull apart the two halves. The seeds will be exposed in the halves. On each half spread the core out so that the seeds are exposed a bit more. The final step is to put the pomegranate half over a bowl in your hand and smack the outside with a wooden spoon so that the seeds become dislodged and fall into the bowl. So much easier than picking each one out and making a mess. You can now also find them pre-seeded at the store. Slice around the pomegranate to get the seeds out without slicing through. Make sure to place your fruit in the bottom of the pitcher BEFORE pouring in your Sauvignon Blanc. You can always substitute the Sauvignon Blanc for Moscato if need be . Refrigerate the Sangria for at least an hour prior to serving. Let your fresh fruit soak into your white wine. Don’t forget the garnish, it’s part of the fun. Last but not least, don’t have just one glass! All of your fresh fruit is placed inside a large pitcher and covered with Mirassou Sauvignon Blanc. The key to a good Christmas sangria is letting the fresh fruit soak into the white wine. You’ll want to lightly stir everything and set the pitcher in refrigerator to steep. I try to make this winter Sangria the night before, but if my fridge is full I’ll make it in the morning so that it has plenty of time to steep before it is time to enjoy. 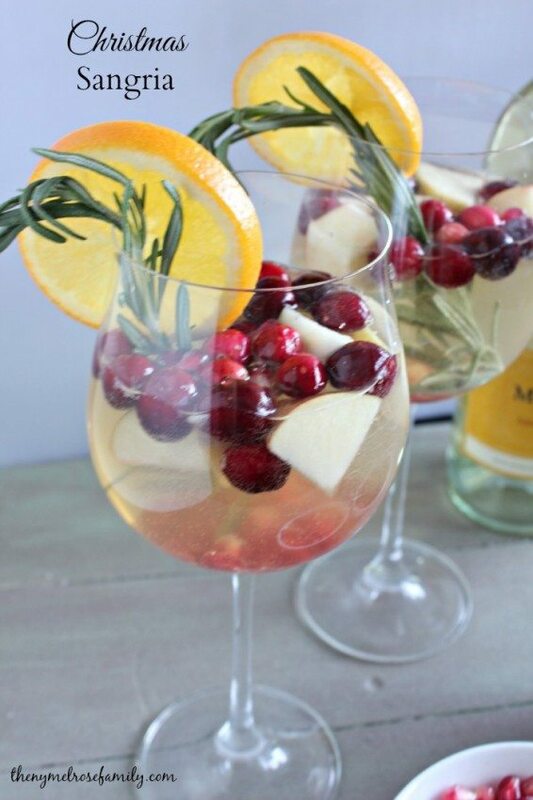 Just before serving your Christmas Sangria you’ll want to add in the white grape juice and cranberry lime seltzer as well as a bit more fresh fruit. Garnish with orange slices and rosemary. I garnished the glasses with a sprig of rosemary and an orange slice. This Christmas Sangria is one that you’re not going to want to pass on. It is the perfect sangria that will impress your guests with it’s flavor and presentation. Christmas Sangria is a holiday drink that everyone can get behind. It combines the sweetness of Sauvignon Blanc and the citrus flavors of the fruit. 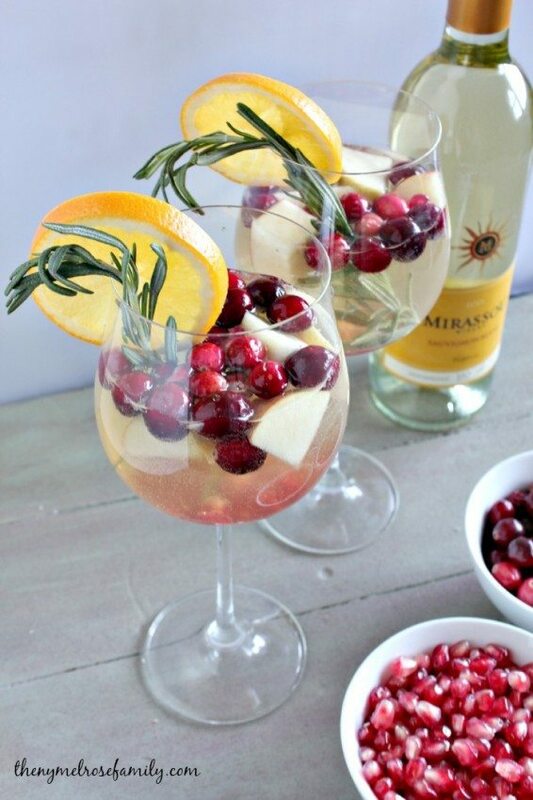 Christmas Sangria combines seasonal fruit like cranberries, pomegranates, apple and orange slices with white wine, white grape juice, and sparkling seltzer to create a beautiful, sweet, and crisp holiday drink. 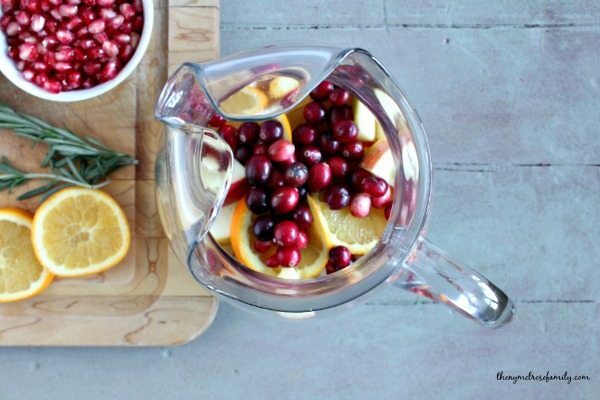 Add the apple chunk, pomegranates, orange slices and cranberries to a pitcher. 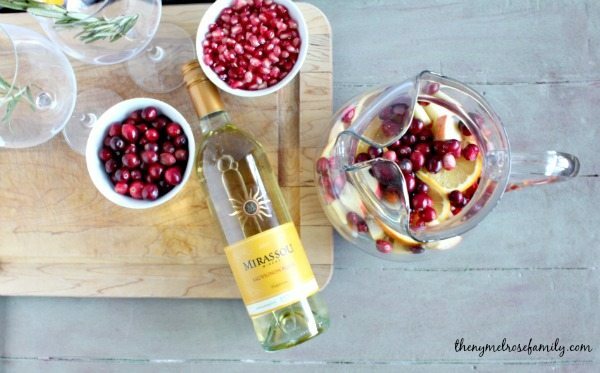 Pour 2 bottles of Mirassou Sauvignon Blanc over the fresh fruit and refrigerate overnight or for at least 4-6 hours. Just before serving add in cranberry lime seltzer and white grape juice. Garnish each glass with a sprig of Rosemary and an orange slice. Jenny – This looks fantastic! Can’t wait to make it for the holidays!